Contact/Exposure - Smoke/Toxic Fire Prod. It is with deepest regret and sorrow to report the line-of-duty death of Captain Robert Burton, IAFF 7th District Local 469, Yakima, WA. 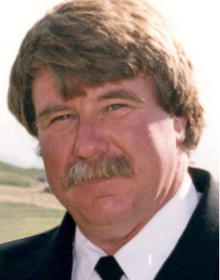 Brother Burton, 62, passed away on December 25, 2017 from melanoma. The funeral will take place at 1:00 PM on Friday, February 9, 2018 at Stone Church, 3303 Englewood Avenue, Yakima, WA 98902; phone 509-575-3720. Expressions of sympathy or condolences for the family or the Local can be sent to Local 469 at 6 S. Second Street, Suite 416, Yakima, WA 90901. "Bob" was born and raised in the beautiful Yakima Valley, and graduated from West Valley High School in 1974. In High School he played football and tennis, and participated in youth ministries and outreach. He also loved cars, all things mechanical, and attended Wyoming Technical Institute. He was an avid race car fan and crewed for many years on the Don Doudy team out of Yakima, racing throughout the western United States. Bob also taught auto mechanics at Yakima Valley Community College, while working at Lynch Motors in Yakima. In January of 1984, Bob began his career as a firefighter for the City of Yakima. He loved the industry and advanced from Firefighter to Lieutenant, Captain, Training Captain, and also served as an acting Battalion Chief. Bob retired from the City of Yakima in June 2011 and embarked on a new career with Emergency Reporting Inc., in Bellingham, contributing as a trainer and product owner, developing software programs for Fire Department operations and training management. He was on board while the company grew from a small regional business, to become an industry standard, serving fire departments across the United States and around the world, including the US military. He loved interacting with firefighters and fire departments on a daily basis, and loved his work and co-workers at ERS. Bob and wife, Peggy moved to Whidbey Island upon his retirement from YFD in 2011. They enjoyed life on the Island and boating in the San Juan Islands with their three daughters and close friends. Bob retired from ERS in August 2017. He had been diagnosed with stage 4 Melanoma. Bob's cancer diagnosis was determined presumptive from his long career as a firefighter. He had fought melanoma for over twenty years and was an advocate for firefighters facing similar health issues due to toxic exposure on the job. Bob participated in the annual tour by fire truck with a team of firefighters on the Code 3 for a Cure, "Mission of Hope and Honor," cross-country from California to New York City, offering support and conducting outreach and education at fire stations all along the way. Bob was honored to serve on the Board of Directors for Code 3 through 2017. Bob is survived by his wife Peggy, three daughters Camille, Lauren, and Genevieve; son, Cody Burton, Lieutenant, City of Yakima Fire Department; and sister, Effie Burton.